corn starch then deep fry in the coconut oil. Meat: you can use either chicken breast cut into small pieces and grilled or my favorite, fried Tofu. 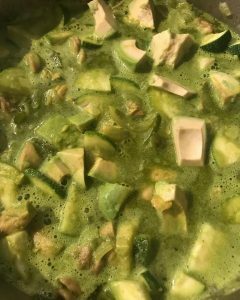 Sauté chopped onions, peppers, garlic & ginger in coconut oil for 5 minutes, then add zucchini, sauce on low, then pour the green curry in the pan from the blender, warm the curry, add the Avocados, cook on low until Avocados are warmed. Then add chicken or tofu, coating in the curry sauce, pour this combination over brown rice or rice noodles & enjoy! The first time I had this Curry at a Thai restaurant, I wasn’t sure if I would like warm avocados & now it’s one of my fave meals! Avocados are so good for you, too, high in Omega oils, Oleic acids (a cancer preventer), Lutein, Folate and the good fats!